Designed and custom built for the education sector, particularly for pupils aged 11 years to adults. 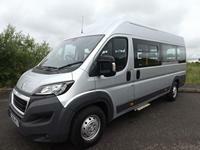 This Minibus is highly suited to 6th form, College, University, Student Union or Charity use. Drive this Minibus on a car licence, no D1 required (conditions apply), yes you CanDrive this on a B licence! The base Peugeot vehicle features a 2.0 BlueHDi Euro 6 diesel engine and 6 speed manual transmission, meaning excellent performance combined with impressive fuel economy and low emissions. Heated electric wing mirrors with 4-way adjustment, electric windows, remote central locking, height adjustable drivers seat and steering wheel are standard equipment. This is a CanDrive Maxi minibus, with an additional payload of 450kgs over the CanDrive Light and 80mm more legroom, making it ideal for passengers aged 16+. 14 x M2 tested/certified rear 425mm wide saloon seats, fitted with 3 point adjustable seat belts suitable for all ages, anti-vandal ABS plastic seat backs and finished in Dark Grey Peugeot trim to match the driver and front passenger seat, with red seat belts and piping along with padded headrests. 4 x rear removable quick release seats to accommodate additional luggage or the occasional carriage of a wheelchair passenger. Portable removable telescopic wheelchair ramps are included. CanDrive Maxi is IVA tested where applicable, is provided with an IVA (Individual Vehicle Approval) Certificate and has been designed and / or adapted to enable you to drive it on a car licence - conditions apply. Lease for £399 + VAT per month over 5 years. Still wondering whether to buy or lease a new minibus? Our unique Try Before You Buy and Try Before You Lease deals let your establishment experience a minibus for up to 6 months, with no long-term commitment or obligation.